Ok ok, I've had a number of emails asking for an update as it's been ages since I last posted. Fair enough. I went into the Christmas season training under a black cloud and the post I had thought of submitting was going to be called 'At the expense of everything else'. So let's just take a quick look back into late 2009. I set my sights on having a crack at the 100km road champs (Feb 2010) so was on a TON of mileage. Weekend runs were 4-6 hrs and booooring. I was training around 2hrs a day through the week maintaining my unbreakable run streak. Everything was an effort and none of it felt rewarding yet I was pursuing my race goal with dogged determination. I jogged a lot last year. A LOT. So everything felt slow. All tempo, rep work and intervals were dropped in favor or yet more steady mileage. I began to wonder if I still had leg speed or if I had turned into one of those ultra distance shufflers. Racing: It's the speed work you've been avoiding! Concerns were put to bed when I ran a 5km PB (and Eastside course record) 15:26. A 10km* PB (9.9x km) 31:55. Followed by a 72 minute half marathon. All off tons of base work with little to no taper at all. From memory I did something like 10 races in the two weeks over New Years. All the while training for a 100km race in my not too distant future. Of course there is the satisfaction of going fast, winning, and the associated trinkets, but most of all this was an important boost to my confidence. I was certain that I had jogged myself slow. WRONG. The message I have for you all is easy mileage, and nothing else, can still make you a good runner. Even over the short stuff. OK, so I put some mileage to use over the short stuff. That's great but what about the target 100km? Can I race long? That was January's question. I was feeling a little 'raced out' when I got back from the beach but keen to stay on track and keep the km's ticking over. Some time around mid-Jan I ran 25km to Cambridge and back before collapsing on my front lawn in a heap. I got through to about 40km fine but the last 10km just dragged on. What the hell? If I can't run 50km well how the hell am I going to do any justice to 100km? Oh dear, black clouds again. So I found myself at the end of January again worried about my form. This time it wasn't speed, but my long-run aerobic engine and stamina. I went to Whakapapa for the 'Tussock Traverse' in my biggest mileage week ever. Never a good idea to race when you've clocked more hours and miles then ever before but then when have I ever taken the easy path to something? 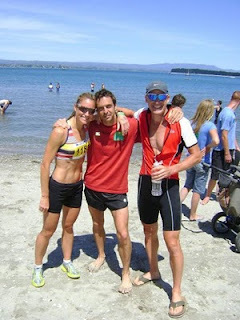 In Jan 2009 I added 27.5km to this race by running from the finish-line to the start in time to join the race proper. An insane 3hr addition which obviously doubles the race distance. I call it the Tu55ock Reverse (t-shirts now available!). This year I was joined by Dawn Tuffery, a fellow Hawks runner with the same disfiguring mental illness to run stupid distances. It was still pretty dark when we left Whakapapa but made it to the race start with enough time to neck a couple Powerades before heading off with the fresh 300-odd strong field of runners. Not far into the race I found myself in the top 10, and by 5km I took the lead. That was when I sped up. The conditions were good and the trail in better shape then ever before. Feeling comfortable throughout I crossed the line in 2:07. 2 minutes off the course record having run a 3:07 warm up. A good result made only better by the fact I had rounded out a training week that saw me covering 205km in around 17hrs. It was a long day after a tough week and I was smiling again. Shoo black clouds, SHOO! With the 100km Road Champs looming there was little left to do now but taper and pray I had done enough. 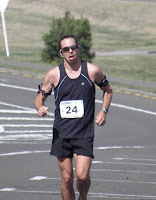 The 100km course was changed to remove some of the lumps which meant I faced 4x25km 'out-and-backs' on SH1 south of Taupo. Yawn. The race started at 3:15am so much of the early hours were run under star light and headlamp. Very, very cool. Not surprisingly everyone peeled off into the distance and left me looking at my watch wondering what the hell was wrong with my math. Nothing as it turns out. Pretty much everyone was behind me by day break. I ran through to about 60km with Martin Lukes who is without a doubt the #1 ultra distance runner in the country having represented NZ the world over for the last 10 years. What an honour and a privilege it was to be talked through the majority of my 1st ever 100km road race by someone who really knew their stuff. Top guy. A few people have said to me that they thought it was rather unfortunate that Martin had entered pretty much taking the national title off me before the race even started. To be honest I was of the same opinion for a while until I came to the realization that if I was going to be the best in the country I had to beat the best in the country. The greatest victory is the one you really had to earn. I don't want a national title to be handed to me as if it were a spot prize. Around 55-60km into the race Martin started increasing the effort and it wasn't long before he was a long way ahead. Somehow I rallied and shook off the fatigue to run a pretty quick 10km too the 85km mark. Martin had gone from 8 minutes ahead to less than 2. I could see him clearly now as though he were only about 400m ahead, I was closing on him. The thought of winning was starting to creep in until BANG! CRAMP. As sudden and as unexpected as if I had been hit by sniper fire. My legs started to explode. Every major muscle south of my waist blew as if someone was twisting bubble wrap. I had just passed the 85km mark and my race was pretty much over. It was no longer a question of winning but a question of finishing. I ate a handful of table salt, downed almost an entire bottle of 'cramp-stop' and staggered on. I was still running with occasionally screaming as the pain shot up and down my legs. Visions of crawling on all fours started playing in my mind. I was going to finish this or die trying. The good news (for some of you) is I didn't die. I completed the 100km in 7:45 about 26 minutes under the old course record set by legend Mark Bright. 2nd place, 15 minutes behind Martin. I hadn't planned on going under 8 hours so I was wrapped with that result. Happy to just finish if I perfectly honest. Dawn took out the women's title in a stellar début performance also qualifying for World champs. Her and I we're both grateful for the help we had out there. Neither of us could've done it without the super support we received from our friends and family. Well, with an almost certain 100km race on the cards for IAAF Worlds in November, all efforts must now be diverted to recovering and training to improve on my 7:45. The months ahead will be my most focused ever. 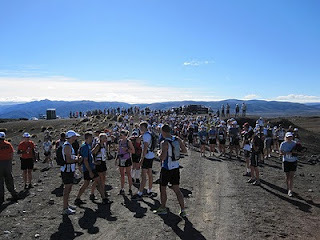 Tarawera Ultra lays in the way of a good recovery but I can't resist this awesome event. As defending men's champ I will be in attendance if only to hand the title over to a worthy winner. The 100km on trail will be a nice break from the road miles I have laid down in the last few months. A good opportunity to further condition myself both physically and mentally to the rigours of the distance. I have passed 900 days of consecutive running but the future of this streak is uncertain. It is almost certain that the relentless abuse I dish out to my legs is not conducive to training and performing at my absolute best and the focus is now on World Champs. It'll be a VERY sad day if I have to break my streak for any reason less then a serious injury. So hard is this decision that there have been days when I have hoped for serious injury. The hardest thing I may ever do in my running career is to not run. Oh no, black clouds again! Until next time, keep training, stay positive, and never think you don't have what it takes to be great.